Until now, varicose and spider vein removal was a lengthy and painful process with needles or other invasive treatments. Now, using the new combined technology of the VascuLight system, unsightly veins of all types can be treated simply, non-invasively and successfully. Unsightly veins can be a problem for millions of men and women, the world over. This problem affects a wide range of age groups, skin types and lifestyles. It is estimated that in many areas over 60% of the adult population suffers from varicose veins and spider veins. Varicose veins, usually the deeper blue veins, need different treatment from the discoloured clusters (“spider veins”) that are near the skin surface. For this reason, the VascuLight system is equipped with two different light technologies. Fortunately, there is now an effective non-invasive treatment for most cases. 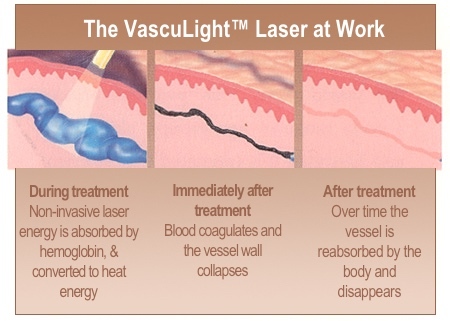 The laser component of the VascuLight system is used to treat larger, deeper veins (i.e. reticular veins). These veins respond to the precise energy level and wavelength of light that is used. The small spot of laser light travels through the skin and is absorbed by the blood within the vein, on the basis of its colour. The resulting heat coagulates or clots the blood and destroys the function of the vein. This process does not affect any of the surrounding tissue. Over time, the vein will be absorbed by the body and will disappear from sight. Are surface veins treated the same way? These smaller, superficial structures require a different technology for successful treatment, not technically a laser at all. Smaller surface veins are treated using light energy. The light energy is absorbed by the blood, changed to heat, and the vein is destroyed: this Intense Pulsed Light (IPL) technology is exclusive to the VascuLight system. With both technologies, your doctor has the ability to use exactly what is needed for the best result. Many leg veins need multiple treatments, often over a few months before the effect is complete. Even small vessels often require time to resolve. Sometimes a bit of “matting” or “staining” surrounds the treated vessel. By using both technologies in the VascuLight system, your doctor can treat the vein and this minor temporary discolouration and offer a complete, excellent outcome. A pulse or laser or Intense Pulsed Light energy may feel like a pinch similar to a snapped rubber band. Chilled gel on the skin and other techniques prevent discomfort. The entire procedure is brief and non-invasive – no needles are used at any time. What preparations must I make? 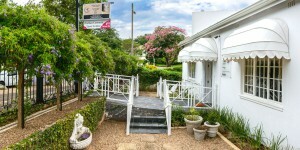 There are no changes in activities required before or after treatment. Prior to and following any type of laser or IPL treatment, you must limit your exposure to the sun; treatment should not be performed on tanned skin. Contact us to find out more about this amazing technology, or to book an appointment or a free consultation.